However, on second thought there is no reason that his epic poem could not apply also to the "Mighty F"! We did often have a "tattered ensign", it did wave on high, our eyes surely dance to see it in the sky, we shouted many an obscenity at those Kamikazes off Okinawa-while our five-inchers, forties and twenties roared, and lastly, the"Mighty F" will sweep the clouds no more! 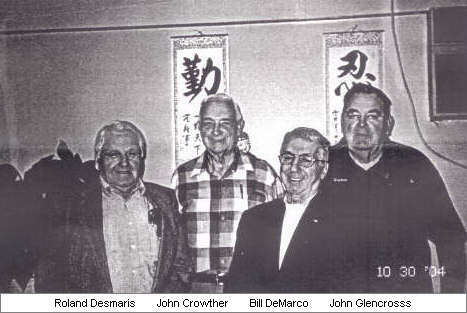 On the following page is a complete report from Bill DeMarco about the October Cape Cod reunion plus a picture of the attendees. The typing is my wife's from her computer which you will not:i.ce is quite superior to my typing. She's trying to convince me, to use her computer but I'm too damn old and stubborn to learn! Bill is going to try again next year and keep this in mind as a good chance to once again get together with your old shipmates. The Cape Cod reunion went this way. John Crowther and Betty came and also John Glencross and Roland Desmaris and his wife, Irene came down. Friday and Saturday night we all had supper together and when you get together like we did you can't imagine the stories that came up. As you recall, most everybody stayed close to their own Divisions aboard ship and you really never knew what was going on elsewhere aboard ship. That was the best part of hearing all these stories. John Crowther and I looked at each other and said "I don't remember that happening and it gets better as the night goes on so that no one wants to go to bed." Anyhow, I really love that part of us getting together. I was hoping that more fellows showed up, but like you said most of us are in our eighties and some are not feeling like they could travel or are not feeling well themselves. The weather was a little cloudy and we didn't see the sun at all. We missed Joe and Christine DeSisto very much. It's hard to believe that when we had our first Cape Cod reunion in 1996 we had 11 shipmates and since then we lost 7 of our friends. Sorry to hear that you weren't able to meet John Crowther: He's such a great guy to be around. I am hoping to go down to Washington four days in April with my son as I want to see everything. They say it's beautiful at that time of the year. Well, P. T., thanks for your help and who knows, maybe next year will be a little better. .
0 to 4: Steaming in company with Task Group 51.12 enroute Iwo Jima, Kazan Islands. Course and axis, 0130°(T) and (pgc), 011°(psc). Standard speed 12 knots, formation steaming at 13.5 knots. .OTC is CTG 51.12 in AUBURN. Comscreen is CDS58 in VAN, VALKENBURG. FULLAM in stat,ion No.6 (8303) of 10 ship anti-submarine screen, spread equally aver 200° arc, orientated on fleet axis. Ships in Condition of Readiness II, steaming on boiler No's.2 and 4. 0112 Fleet course and axis' changed to 048°(T) and (pgc), 047°(psc). Screen reorientated on axis. 4 to 8: Steaming as before. 0516 Formation changed Base course and axis to 018°(T) and (pgc) 016° (psc). 0550 General Quarters for dawn alert. 0615 Commencd. zig-zagging according to plan 6 (USF 10A). 0635 Secured from General Quarters. 8 to12: Steaming as before. 0800 Mustered crew on station no absentees. 0817 VAN VALKENBERG left screen to pass mail. Screen reorientated to equalize. On station. 8310. 0908 .Formation changed to course to :330°(T) and (pgc); 328°(psc): by emergency turn: movement to avoid area.in which two ships of: Transport Group BAKER's screen investigating sound contact. 0913 Formation changed course to 280°(T): and (pgc), 283°(psc), by turn movement. 0932 Formation changed course to 340°(T) and (pgc), 338° (psc) by turn.movement, resumed zig-zagging according to Plan No. 6. 0945 STANLY and HUDSON left screen to investigate sound contact developed by screen of Transport Group BAKER. VAN VALKENBuRG returned to screen.. Screen orientating to equalize. 0950 on station No.4 (7320 screening. diagram No.58 USF 10A) on circle 7. 1105 Formation .changed speed to:14 knots. 1120 GUEST leaving screen to deliver mail. Screen reorientating: to equalize. 1146 GUEST returned to station. IRVIN leaving screen to pass mail. Made daily inspection of magazines and smokeless powder samples, condition normal. 12 to16: Steaming as before. 1253 Formation changed speed :to 14.5 knots. 1319 Formation ceased zig-Zagging and resumed base course. 1329 STANLY and HUDSON rejoined screen. FUL.LAM takingg station No. 6 (8288) in nine ship screen. 1334 Formation changed base course to 005°(T) and (pgc); 007° (psc). 1410 IRWIN .rejoined screen. FULLAM taking'station No; 6 (8303) in ten ship screen. 1441 Formation changed speed to 4 knots. FULLAM patrolling on station at 10 knots. WATERS commnenced passing mail to AUBURN. 1506 Formation changed speed to 4 knots. 1514 Formation changed speed.to 14.-5 knots. WATERS completed passing mail to AUBURN. 1550,Formation changed base course to 000°(T) and. (pgc); 000°(psc). lRWIN leaving screen to pass mail. FULLAM taking station No. 6 (8285) in nine ship screen. 16 to18: Steaming as before. 1730 Forma:tion course and axis changed to48°(T) and (pgc) 347°(psc). 1745 STANLY and HOWORTH departed screen for assigned Picket duty. FULLAM taking station.No. 6 (8303). 18 to20 Steaming as before. 1805 BULL arid WATERS joined screen in station Nos. 2 and 4. Proceding to station No. 6 (8303). 1940:Lighted fires under boilers No. 1 and 3. 20 to 24, Steaming as before. 2105 Secured boiler Nos. 1 and 3. 2320, Set Condition I, unidentified aircraft bearing 270°(T), distance 60 miles. 2321 Lighted fires under boiler Nos. 1 and:3. 2352. Set Condition II. All aircraf't in:vicinity Identified as friendly. Secured boiler Nos. 1 and 3. /s/ G.M. BOYD, Lieut-Comdr., USN ------------------ /S/WATKINS, Lieut., D., USNR. 0 to 4: Steaming in company with Task Group 51.12 enroute Iwo Jima, Kazan Islands. Fleet course and axis 348°(T) and (pgc); 347°(psc), speed 14.5 knots. Formation in special cruising disposition 3AL5 (ComPhibsPac OpPlan A25-44). OTC (CTG 51.12) ,in AUBURN station (1000). Guide in CECIL. station (0.5090) Screen commander GDS 58 in VAN VALKENBURG. FULLAM in screening station No.6 (8303). Ship in condition II. Steaming under boilers No. 2. and 4. 0032 Formation changed, base course by turn movement to 353°(T) and (pgc); 352.°(psc). 0040 STANLEY left position as :radar picket to contact transport Group Baker with message from CTG 51.12. 0045 Formation changed speed 13.5, kriots. 0105 Formation changed speed to 13 knots. 0158 Formation changed speed to 12.5 knots. 0315 Formation changed base course and axis to. 314°(T)" and (pgc); 315,°(psc),. screen reoriented on base course. /s/ T.D. WILSON, Lieut., USN. 0405 Formation changed speed to 10 knots. 0437 Formation changed speed to 8 knots. 0446 FULLM! departed screen; :proceeding at various courses and speeds to sector Able 11 of anti-submarine screen 3A, (CTF 51 Oporders A25-44. 8 to 12: Steaming as before. 0900 Executed H-hour as scheduled in CTF 51 Operation Order A25-44. Mustered crew at stations, no abseritees. 1425 Relieved on station by HEALY, proceeding on various.courses at various speeds to Fire support sector 6 as ordered by:CTF 51. 1612 Stopped all engines lying to off north eastern side of Iwo Jimad, Kazan Islands. 1641 Commenced firing at targets of 'opportunity on Iwo Jima. 1739 Completed firing. Set condition II; expended 67 rounds o 5"/38 AA common ammunitori. Steaming on various courses at 20 knots to partrol station south of Iwo Jima. 18 to20: SteamIng as before. 1854 On statfon C-9 (CTF 51 OpPlan A25-44) in outer anti-submarine screen. Patrolling station on courses 058°(T) and (pgc); 0.57°(psc) and 258°(T) and (pgc); 256°(psc). Speed 15 knots. Passing through the center of patrol sector in: a easterly direction every half-hour. 1907 Sounded General Quarters to repel air attack. Set condition I. 20 to 24: Steaming as before. Enemy planes in area. 2050 Set condition II; area clear.of enemy planes. In case you are wondering, here is the explanation for the preceding pages. The first is an article from our local paper that really got to me and I can certainly picture similar nights aboard the FULLAM. Although much, much warmer I remember many mid-watches when the sea and sky were exactly like he describes. If you may have forgotten, we spent two Christmases aboard the FULLAM. In 1943 we were anchored in exotic Purvis Bay, Tulagi, Solomon Islands; in 1944 we were in Pearl Harbor having recently arrived from San Francisco after our overhaul. On each occasion we were royally entertained by the fantastic FULLAM FOLLIES! Although I had already left the ship for discharge, she was tied-up in the Bremerton Navy Yard in 1945. This coming February will mark the sixtieth anniversary of the invasion of Iwo Jima and surely there will be much publicity on this event in the papers and on television. Anyway, I found the log entry for that date, the 19th, and included that also. "I recall an incident I had. I was on the port wing of the bridge while passing Tinian to port about two or three miles away. I noticed ripples or things falling in the water about several yards distance. After wondering what was causing it, I suddenly realized it was machine gun fire falling short. I quickly decided to take in the view from the starboard side and look at Saipan." I received a letter from Arch Kellems that I will save for the next newsletter. In it he tells of all the ships he served on after leaving the FULLAM and ultimately spending 30 years in the Navy. Arch then retired as a Lieutenant Commander. Meanwhile, here's wishing each on of you and your families a blessed, prosperous, and most of all, a very healthy 2005!